Stanford University is chock full of resources and enterprising individuals, making it an ideal place to solve unique problems. So when Cantor Arts Center wanted to find a better way to cover up the exposed ends of a totem pole, they were right in believing that someone on campus could help. In order to accomplish this, the museum contacted the University’s Product Realization Lab (PRL)—part of the Mechanical Engineering Department. The Associate Director of the PRL, Craig, first discussed the project with museum staff and then proposed it to me and my fellow graduate students. It piqued my interest as well as my friend John’s and just like that the project had a design and fabrication team. Because of our passion for woodworking and the outdoors, when presented with the opportunity to assist in the repair of Northwest Coast totem pole, we both happily volunteered to lend a hand. We were tasked with finding a way to keep water out of the wood and prevent both rotting and splitting in high-risk areas. This meant finding a way to protect the wing tenons and exposed endgrain on the tops of the uppermost portions. Each area had its own issues to address. The wings are attached to the body of the totem with mortise-and-tenon joints. Unfortunately the angle at which the wings are attached causes them to act like rain gutters, funneling water down the wing and directly into the mortises. In the below picture you can see the sediment left over from the pooling water at the edge of the mortise-tenon joint. That’s not good for the wood at all! This problem is now doubly important as the totem has an epoxy-lined, watertight mortise joint that will retain water even more effectively. The heads of the thunderbird (the top most carving) and raven (the figure directly below it) have large areas of exposed cedar end grain. Water easily enters the wood here, resulting in expansion and contraction and leading to splits and checks. The exposed end grain is also more vulnerable to fungal growth and decomposition than the closed sides of the totem pole. 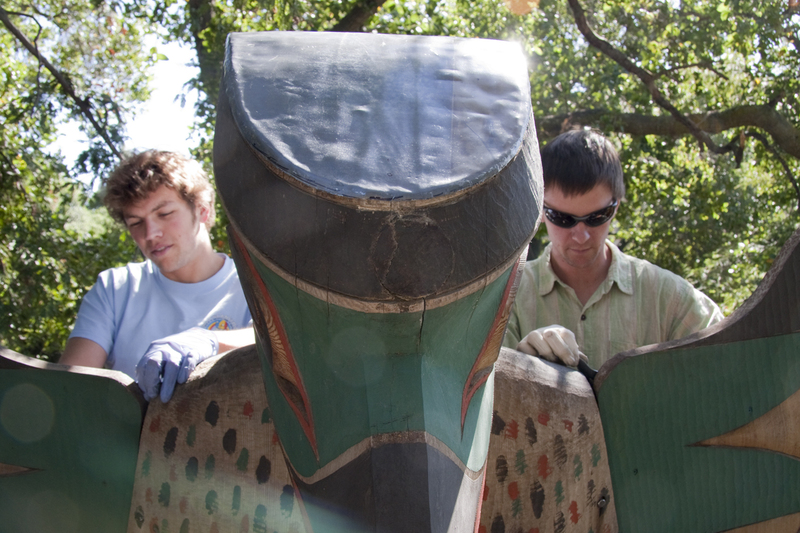 Museum staff had already consulted totem pole restoration experts to give us a head start. They had ascertained that the generally accepted solution to these common problems is to shield the water afflicted areas with with sheetmetal, occasionally supplementing their application with a non-permanent sealant. After discussing various other options with Cantor Arts Center staff (covering a totem pole in epoxy is unacceptable), we climbed the scaffolding surrounding Boo-Qwilla to assess the situation and consider exactly how to proceed. While larger more protective coverings were discussed, the smallest design that remained effective was chosen. The Center wanted to keep the totem as safe as possible without adding any visual distractions. Soon a design direction had been established and it was time to get physical. The Design School at Stanford encourages using rapidly build prototypes and mockups to speed along the process of finding a solution. The designs started off as simple mockups in Photoshop to explore possibilities. Once a general direction was established, we climbed the scaffolding with large sheets of cardstock, scissors, and tape. Paper folds and shapes surprisingly like sheetmetal does, but it adds the benefits of being cheap, simple to work with, and easy to modify quickly. Perhaps most importantly, paper won’t damage the soft red cedar when test pieces are still ill-fitting. Eventually, after numerous trips up the scaffolding with ever-refining paper templates in hand, the fit was perfected and was approved by the museum’s staff. The paper templates were then duplicated in sheet lead. Since the amount of lead we needed was negligible and it was to be installed far out of public reach, Stanford’s Environmental Health & Safety department gave us the go ahead. When rainwater runs off the new flashing it will carry a miniscule amount of the metal with it, covering the totem with a small amount of lead and creating an inhospitable habitat for fungi and pests. Lead is a marvelous material, though much maligned. It shapes even more easily than paper, is soft enough to be worked by hand, and develops a nice dull patina that will minimize visual obtrusiveness. Because the metal is also dense and heavy, it is less vulnerable to high winds or squirrel theft. Lead is relatively safe to work with too, as long as it’s not sanded into dust it can safely be worked by gloved hands. Preventing rainwater from entering the mortise requires the paths of ingress to be covered while the rainwater is channeled off the wing to prevent pooling. To keep the solution as minimalist as possible, triangular caps were sealed in place to suit both tasks. First, the caps are large enough to cover the entire area above and around the mortises. Second, the edge of the cap that runs along the tenon needed to be angled in a way that pushed the water off the edge of the wing, rather than pooling at thunderbird’s shoulders. After a bit of analysis, an oblique angle was found that would result in a net-downhill path off the tenon. With the cap sealed along this line water rolls harmlessly off the back of the wing’s tenon. Lead caps were fit for the two largest end grain surfaces on Boo-Qwilla: the heads of thunderbird and raven. Covering thunderbird is relatively easy since the cap has little curvature and a simple outline. Covering raven is considerably more difficult because, well, thunderbird is standing on its head. The cap must be fit around thunderbird’s feet in two relatively complex pieces. Here it’s especially important that the tricky, iterative refinement of the cap forms is done in paper to avoid dinging or scratching the soft cedar. All of the lead caps are cut so that the water will run off the endgrain surfaces at steep angles where possible. If pieces must overlap they are designed to be “shingled”, ensuring that water running off one piece will continue running off the other. Beads of non-permanent, non-skinning butyl caulk were laid down about one inch in from the edges that would benefit from additional sealing. (i.e. those that are most exposed to the elements) As in any restoration project, reversibility is a much coveted characteristic and the long tack-life of this product could become important if the flashing needs to be removed some time in the future. Once each piece was fit, they were screwed down to prevent shifting. Due to the possibility of galvanic corrosion between the steel screw and the lead sheet, nylon washers were used to separate the two. Moreover, Western Red Cedar (Thuja plicata) is highly acidic and would corrode galvanized steel screws at an accelerated rate. Because of this stainless steel fasteners were used and their heads were painted to match the matte gray of the lead. Each piece of lead had its edges left slightly oversized so a final trim could be done in place, thus ensuring a perfect fit. Then, the custom lead covers were filed smooth before their edges were gently rolled with a leather mallet. 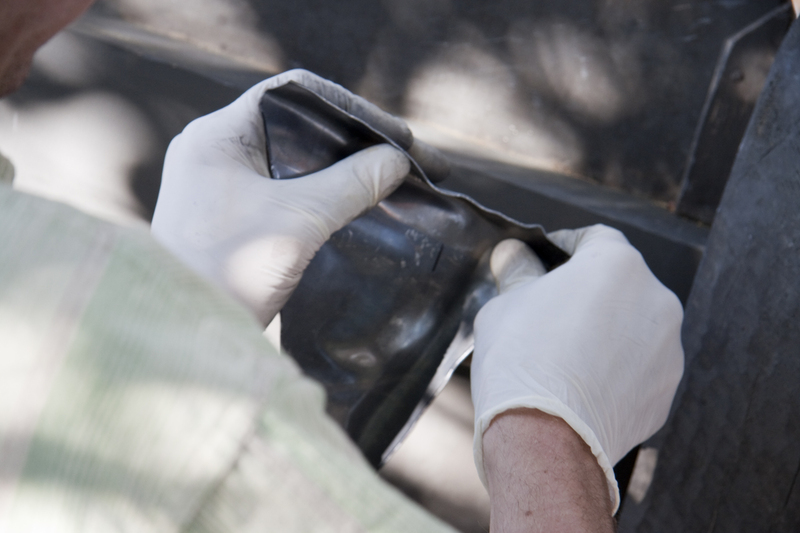 Rolling the edges of the lead ensures that the vulnerable ends are completely protected from water and insect ingress. Rolled edges also increase the strength, rigidity, and filtering of the sheetmetal pieces for structural purposes. Ultimately seven separate pieces of metal were cut, formed, sealed, and screwed to Boo-Qwilla: a hat and a pair of two-piece shoulder pads for thunderbird, and a two piece hat for raven. It took weeks and weeks of paper test fits, discussions, material planning sessions, and sheetmetal forming to get the parts just right. Hopefully, all the planning and effort will result in no one ever noticing the change. All in all, for a pair of guys who consider themselves engineers, designers, and craftsmen, that’s a job well done.